to putting lunkers like this in the boat. Anglers after double digit sized walleye have two windows of opportunity here in the Great Lakes region. Right after the ice breaks up in the spring and again just before the ice forms in the fall, walleye are on the feed bag. 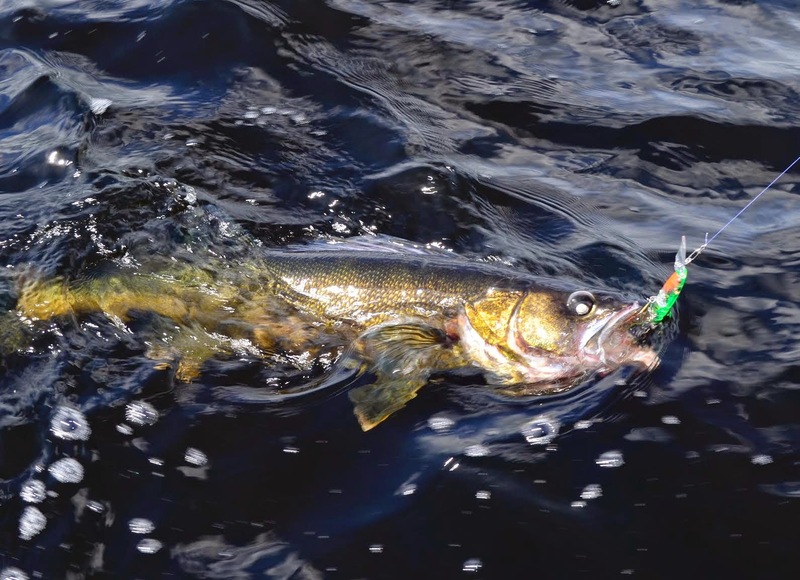 Adult walleye feed aggressively prior to spawning in an attempt to gain as much “egg mass” as possible. The problem with targeting walleye early and late in the year is the water is icy cold and walleye can be lethargic despite their desire to feed. 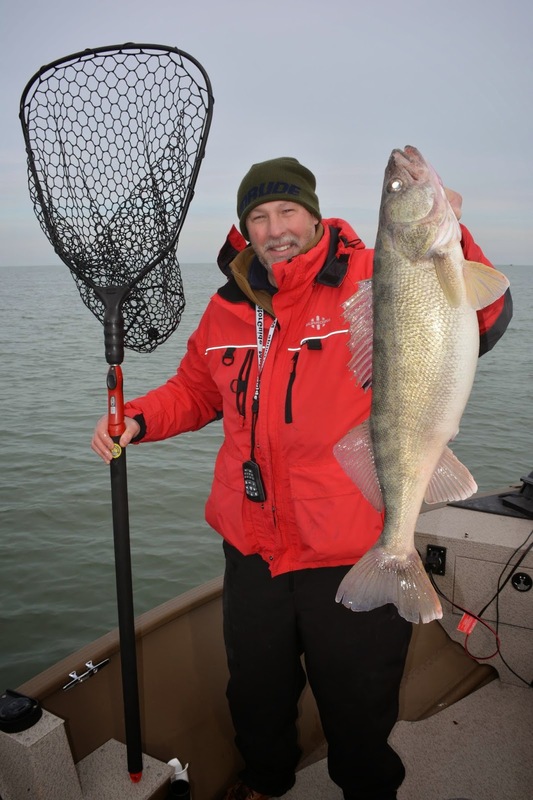 The keys to catching walleye early and late in the year boil down to picking presentations that are tailored to the fishing in cold water. I often joke that the three best speeds for catching trophy walleye are slow, slower and slower yet! In ice cold water walleye will bite, but they are reluctant to chase fast moving food. 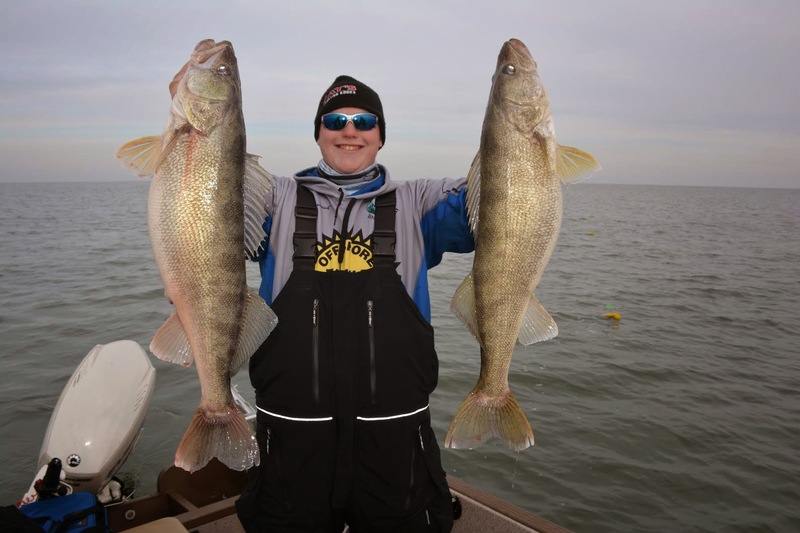 By simply slowing down our presentations walleye fishing can go from ice cold to red hot. 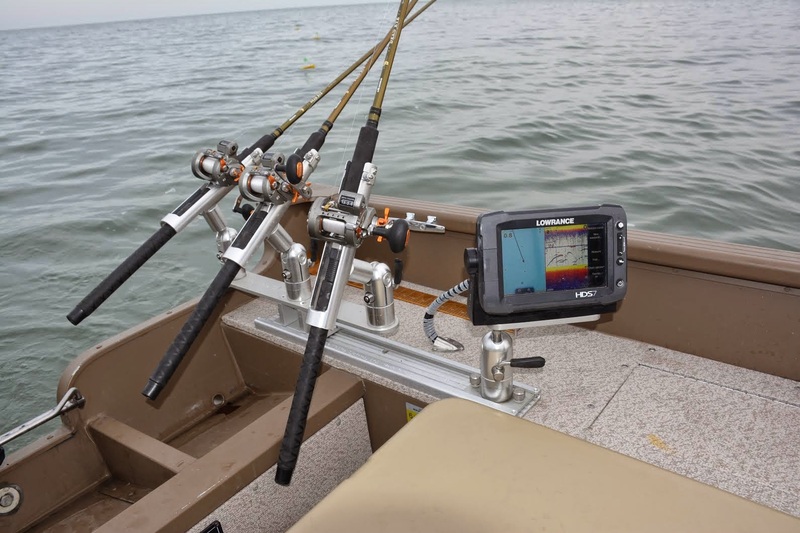 Trollers after early and late season walleye are going to find that speeds ranging from .75 MPH to about 1.5 MPH produce the most bites. Second only to speed, the next concern a cold water walleye angler needs to be concerned with is lure action. Crankbaits produce the vast majority of the double digit walleye caught every year on the Great Lakes. Unfortunately about a thousand different brands, models, sizes and colors of crankbaits are on the market and only a small assortment routinely catch walleye in cold water. Stud walleye come most often on a very small selection of crankbaits. also the Rapala Deep Husky Jerk 12 and the Yo-Zuri Deep Crystal Minnow. The short list of proven “cold water” crankbaits includes the Rapala Husky Jerk and Deep Down Husky Jerk series, Reef Runner 800 and 600 series baits, the Storm Deep Jr. ThunderStick, Yo-Zuri Deep Diving Crystal Minnow and the Smithwick Perfect 10. All of these lures have a subtle action that is best described as a top-to-bottom rolling action. This action closely imitates a slowly swimming minnow. Most crankbaits have a more open and aggressive side-to-side action that causes the tail of the bait to swing widely. This lure action produces better in warmer waters. A few crankbaits combine both action types into one lure. For example, the Reef Runner 800 and 600 series and also the Yo-Zuri Deep Diving Crystal Minnow have a defined rolling action with a little side-to-side action thrown in. These baits work best at the higher speed thresholds considered acceptable for cold water trolling. crankbaits is the key to success. Lure color often matters when it comes to cold water trolling. When baits are moving slowly in the water, walleye have the luxury of getting a pretty good look at them before deciding to strike. Lure color is sometimes a triggering element, but more often the key to success is trolling speed and fishing at the correct depths. Some anglers get overly concerned about lure color, losing sight of the big picture in the process. The best advice is to consider lure color as a refinement to a trolling presentation, not the foundation presentations are based on. Finding fish, fishing at the correct depths, fishing slowly and fishing lures with subtle actions are always going to be more important to cold water trolling than lure color. The plus side of lure colors is they give anglers confidence to try new things and also to fish harder. The new “custom colors” that are becoming so popular among walleye trollers get guys thinking about fishing, changing out their lures and that walleye fans is a good thing. Fishing articles are insufferable. How to catch big fish in the spring, summer, fall, and winter! Wow! Read on to see what lures I plug.